New York, for just three days, proved very popular, with people waiting in line for over three hours just to get in. 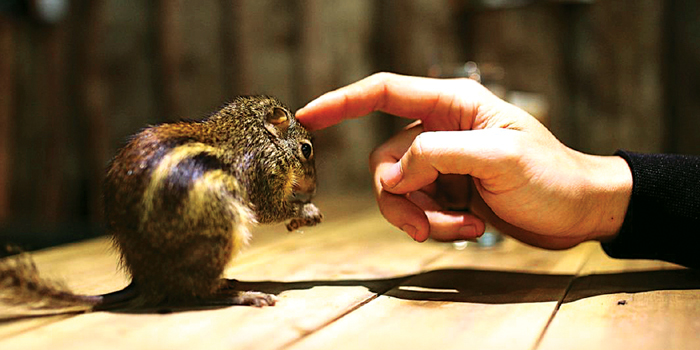 We list popular animal cafes around the world that allow you to sip your cuppa along with some furry friends. CafA� Little Zoo, an interactive Japanese cafA�, offers you a taste of the wild in a charming zoo-like setting, replete with iguanas, snakes, falcons, turtles and owls who will dine alongside you as you are served a choice of Indian, Japanese and a�?Americana�� food. Each table here is equipped with hand sanitisersA� so you can tuck into your meal in comfort. Rs. 200 upwards (approx). Reservations and walk-ins are accepted. At Chiba, Narashino, Tokyo. In Vietnam, Pet CafA� lets you hang with your choice of animal, from snakes and tarantulas to squirrels and hedgehogs, while you sip on some hot tea. Rats and other rodents are also welcome here and the owner, Nguyen Minh Nghia, even claims that they are as friendly as in Ratatouille! CustomersA� sit at small bamboo tables, order a hot drink or juice and interact with animals a�� something Nghia thinks will help people overcome their fears.